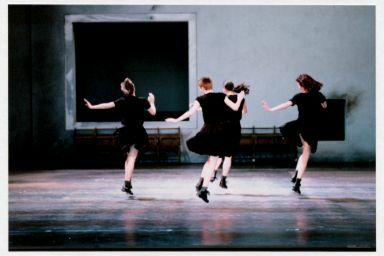 Duke Bluebeard’s Castle, the first opera that Anne Teresa De Keersmaeker directed, was premiered in February 1998 at Brussels' La Monnaie. The performance brings together three pieces by the Hungarian composer Béla Bartók: Mikrokosmos, seven pieces for two pianos (1939), the Fourth String Quartet Quatuor nr.4 (1928) and Bartók’s only opera Duke Bluebeard’s Castle (1911). The starting point of the creation goes back to Bartók/Aantekeningen of 1986, a choreography to Bartók’s Fourth String Quartet. The year after, Anne Teresa De Keersmaeker wrote Mikrokosmos, her first duet for a man and a woman. 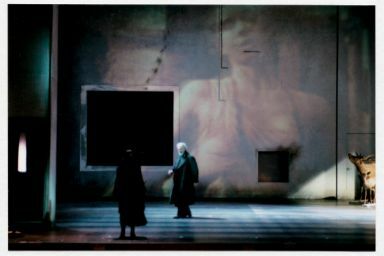 The connection in this performance between Mikrokosmos, Quatuor nr.4 and Duke Bluebeard’s Castle has not been artificially assembled. It is what it is: through Bartók’s music, through the choreographic material of Anne Teresa de Keersmaeker, through the musical crescendo of two pianos to the string quartet to the orchestra, through the spatial decrescendo from big to small and back to big, through the folklore element of the costumes, woven across the three parts, through the man and woman in Mikrokosmos who return in the end as Judith and Bluebeard, through the four dancers of the Quatuor nr.4, who reflect the three previous wives of Bluebeard, through the number seven - of the seven pieces of Mikrokosmos to the seven doors of Bluebeard’s castle, etc.